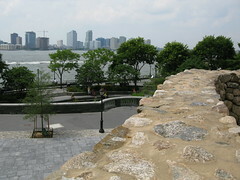 FreshDirect, New York’s premiere online grocery service, made its first deliveries to Roosevelt Island in Manhattan in 2002. Over the years it has expanded into other sections of the city (even New Jersey) and has won legions of detractors and admirers. While critics have blasted the company for “overpackaging” (FreshDirect responded by reducing the amount of packing materials they use) and branded those who use it as “lazy,” I’ve been a satisfied customer since first they began serving my neighborhood. While I find myself in local grocery stores nearly every day, I’ve come to rely on the FreshDirect team to deliver those items that — while cost-effective — are simply too heavy to me to schlepp home: cases of beverages, bags of kitty litter and huge containers of laundry detergent. 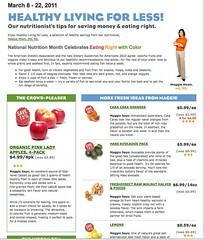 I also scan their weekly newsletter to check out the latest offerings and bargains. This week, however, some of the items currently featured on their Web site under the heading “Healthy Living For Less” don’t seem like such a bargain to me. The St. Patrick’s Day Parade on Fifth Avenue is the world’s biggest, noisiest, happiest celebration of Ireland and its patron saint. Between the dancing, drinking and green hair, it is easy for an observer to think that those who hail from “the land with 40 shades of green” have always been welcome and accepted here. 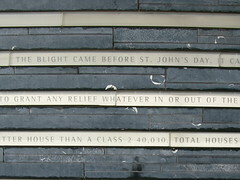 But the story of the Irish in New York has many a tragic side. 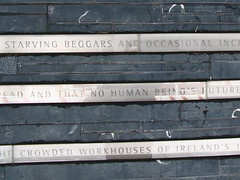 Most terrible is the reason that so many Irish citizens arrived on our shores 150 years ago; they were fleeing the disaster known as An Gorta Mór (the Great Hunger). The devestation began in the late 1840s, when a virus attacked the potatoes planted in the fields of the land where St. Patrick had walked. Cheap, filling, and easy to grow, potatoes were an essential source of nutrition for poor, rural Irish families. When the virus caused the potato plants to wither and their crops to fail, it wasn’t long before starvation set in. The Great Hunger, also known as the Great Potato Famine, lasted from 1845 to 1852. During that period approximately one million Irish people died and two million more emigrated, many of them landing in New York Harbor. 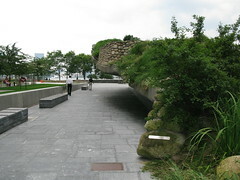 Now, in a quiet corner of Battery Park, near the spot where those desperate survivors arrived, stands the Irish Hunger Memorial. 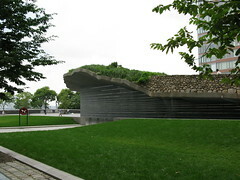 Created by New York artist Brian Tolle, the memorial opened in 2002 on a quarter-acre of land shaped to resemble a burial mound cut from an Irish hillside. 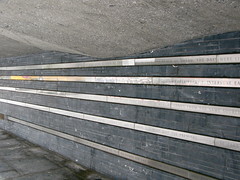 The base of the memorial is made of slabs of concrete interlaced with bands of plexiglass-covered metal bearing excerpts from reports, poems, songs, sermons and letters describing the desperation and destitution of the victims of the famine. These are intermingled with information about world hunger today. 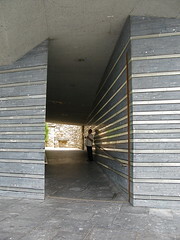 After walking around the base, visitors walk through a short, dark corridor where recorded voices recite facts about the Hunger and emerge into a small atrium lined with stone walls. A dirt path winds up the hill past thirty-two massive stones, each marked with the name the Irish county that donated it, a roofless stone cottage, wildflowers and grasses, all imported from Ireland. 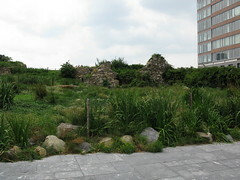 Every aspect of this small patch of land is significant and symbolic; even the size of the space reflects the Irish Poor Law of 1847, which denied relief to those living on land larger than a quarter of acre. 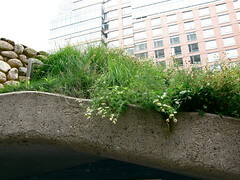 Small, subtle and enormously moving, the Irish Hunger Memorial helps illuminate the wonderful, terrible history of the Irish in New York City. You are currently browsing the Blather From Brooklyn blog archives for March, 2011.